This was our fourth forest tipi (now five with Crazy Horse), beautifully sheltered by a stand of tall cedar trees, and close enough to the creek to hear the comforting sound of the water. It is a painted tipi, and it literally adopted us. The light inside is dimmed and soothing. 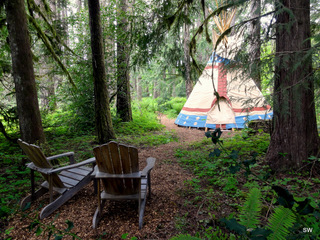 - This tipi also has a beautiful stone floor, covered with a wool rug for warmth and beauty. The bed is queen size, comforter covered with extra wool blankets to keep it cozy in Oregon's cool summer nights. 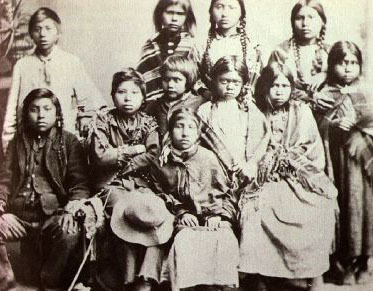 Who were the Calapooya Indians? "Honor the sacred. Honor the Earth, our Mother. Honor the Elders, Honor all with whom we share the Earth: Four-legged, two-legged, winged ones. Swimmers, crawlers, plant and rock people. Walk in balance and beauty."